Did You Know That Cats Can Get Acne? Here’s How to Treat It! In humans, acne is often caused by oily skin, but that isn’t normally the case with cats. 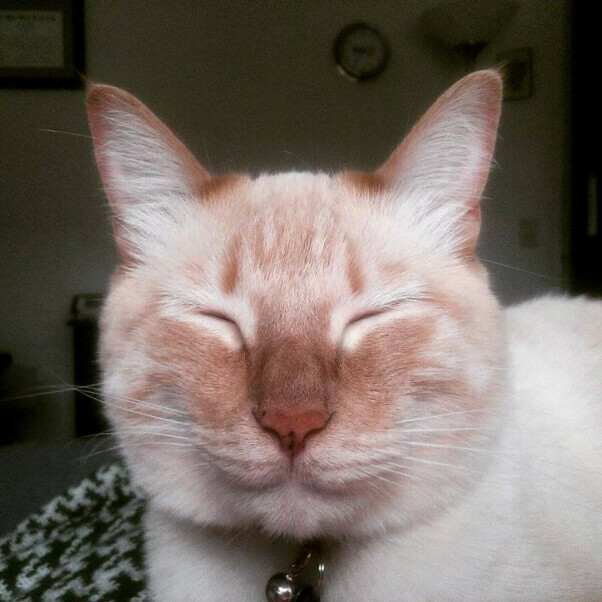 Feline acne can be caused by allergies to fleas or to environmental triggers like pollen or by fungal spores, so flea control is very important and screening for other types of allergies should be done as well in stubborn cases. 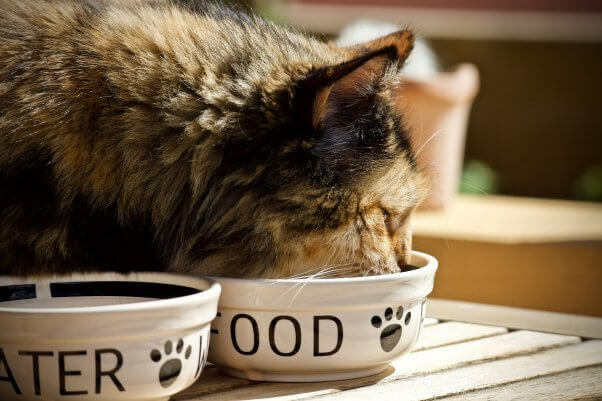 Many cats are also sensitive to plastic, so switching from a plastic food or water dish to a stainless steel or porcelain one may help clear up the problem. Cat acne is most common on the chin or around the mouth, but it can be present anywhere on the body. Appearing as small bumps, it often looks similar to the blackheads or whiteheads that humans get. Some cats have a single breakout, while others have recurring symptoms. If the condition is severe, you may notice hair loss, redness, and even nodules or bleeding scabs. If your cat scratches or licks the affected area, a bacterial infection, which can be serious, may also develop. For this reason, it’s important to remember that you shouldn’t squeeze, pick at, or otherwise try to remove your cat’s pimples. NOTE: Before you begin any treatment, consult a veterinarian. Rinsing a towel in warm water and applying it to the affected area may be enough to soothe mild acne in some cats. A warm compress can reduce swelling as well. Topical treatments—like special wipes or shampoos—are an alternative to oral antibacterial medications for feline acne. 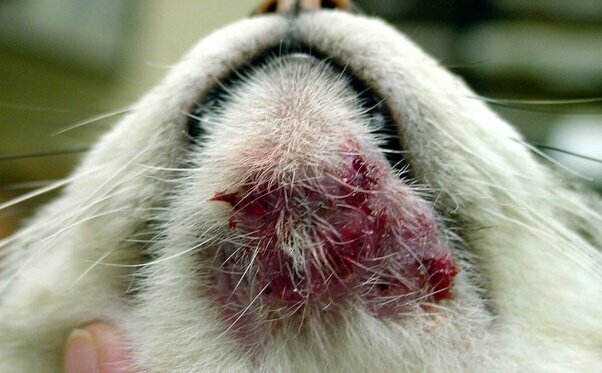 Your vet may prescribe a medicated shampoo or recommend a certain brand of face wipe to help clear up the breakout. Note: Unless a vet specifically tells you to do so, do not use acne products intended for humans on cats. Your vet may perform a deep cleaning of the affected area with an antiseptic ointment, often clipping the hair on and around the chin. Some animal guardians are given a diluted antibacterial rinse so that they can do at-home cleanings. According to PetMD.com, products that you already have in your pantry may be able to help soothe your cat’s acne. After getting the go-ahead from your veterinarian, try cucumber pulp, green or black tea, aloe, organic apple cider vinegar, witch hazel, or coconut oil for mild cases—they may do the trick. Colloidal silver is also very effective at clearing up infections of any kind. If your cat’s acne doesn’t clear up, even with treatment, your veterinarian may refer you to a veterinary dermatologist. Our animal companions can’t tell us when something is wrong with them. It’s important to monitor their appearance and behavior closely to make sure that they’re feeling happy and healthy. While a few pimples are unlikely to pose a threat to your cat’s well-being, there’s a chance that they could be indicative of a more serious, underlying problem. Your vet can check to make sure that your cat’s skin condition isn’t mange, tumors, or even leprosy.